Much of the pre-game hype leading up to the Fire’s tilt with the New England Revolution last Saturday centered on Drogba Watch, as fans waited to see whether an aging striker still has enough magic left to provide some hope for a season that was quickly sinking into oblivion. Discussion regarding Didier Drogba’s effectiveness was the perfect fodder for debate while having a pre-game beer. That discussion, unfortunately, missed the point about what ails this Fire team far more acutely than adding more firepower up top, and that is the atrocious level of defending. Amateurish mistakes were on full display at Toyota Park on Saturday, as the Fire and Revs shared the spoils in a 2:2 draw. Word on the interwebs is that the Chicago Fire, who own Chelsea striker Didier Drogba’s MLS “Discovery Rights,” are now in discussion with the Montreal Impact, who are interested in actually signing the player. Some may call it extortion, I’m calling it a brilliant coup by the Fire front office who are upping Drogba’s value, and then judo-flipping that value into a better negotiation leverage to ship him off to Quebec. The Chicago Fire, floundering in last place in MLS’s Eastern Conference, have passed the midpoint of the regular season and basically face must-win situations in almost every match. It really should be too early to think about results in those terms in July, but the hole that the Fire have dug for themselves has become awfully deep, leaving very little margin for error. 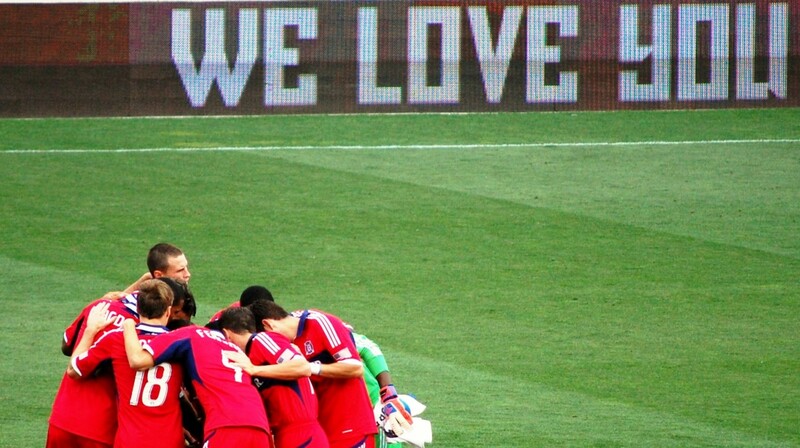 “Winning Cures All Ills” may be a cliche, but it’s never seemed more applicable than this weekend at Toyota Park. Despite Section 8’s “bannergate,” Head Coach Frank Yallop’s job security, “#HauptmanOut,” injury troubles, transfer window scrutiny, and Bridgeview finances, all anyone would take away from Saturday was the spark provided by a rejuvenated Mike Magee, Patrick Nyarko, and Michael Stephens and the clutch finishing of Jason Johnson that delivered the Chicago Fire their first victory over the Seattle Sounders ever. E-V-E-R.
On the coasts, LA introduces Stevie G to the Galaxy crowd and we see Pirlo smooching in a NYCFC luxury box… what moves do the Fire need to make when the window opens on July 8th. Who is most likely to “get moved”? Who is definitely going to stick around?